Ever since the financial crisis, the U.S. economy has grown at a stubbornly slow rate, far less than the 3 percent that was widely considered a sign of good health. This disappointing outcome — the Federal Reserve expects the economy to grow only about 1.8 percent this year — has been blamed by economists on many factors: the financial crisis in 2008, fiscal fights in Washington, Europe's repeated debt crises, China's slowdown and more. But according to provocative new research from Fed economists, there might be a simple explanation for the slow growth — and there might not have been much policymakers could have done about it. If the new explanation is true, it might also explain why efforts to boost economic growth — including trillions of dollars in monetary stimulus and near-zero interest rates — haven't worked that well. In a new paper , the Fed economists argue that America's slow economic growth and low interest rates might have been largely inevitable — and they might not have much to do with the 2008 financial crisis at all. Their main culprit: demographics. The researchers — Etienne Gagnon, Benjamin Johannsen and David Lopez-Salido — created a model of the economy that shows how changes in births, deaths, aging, migration, labor markets and other trends have affected the U.S. economy since 1900. Using that model, they find that most of the decline in economic growth and interest rates since 1980 has been due intractable factors like the aging and retirement of baby boomers, lower fertility rates and longer life expectancy for Americans. They find that these demographic changes account for a 1.25 percentage point decline in annualized economic growth since 1980, which is essentially all of the decline we’ve seen in that metric, according to some estimates. What’s really remarkable is that we might have seen this coming. The macroeconomics effects of this kind of demographic transition “have been largely predictable,” the economists write in their paper. In fact, most of the relevant changes that have weighed on growth and interest rates took place before the 1980s. The biggest drag on the economy has been the aging and retirement of America’s baby boomers, the researchers say. 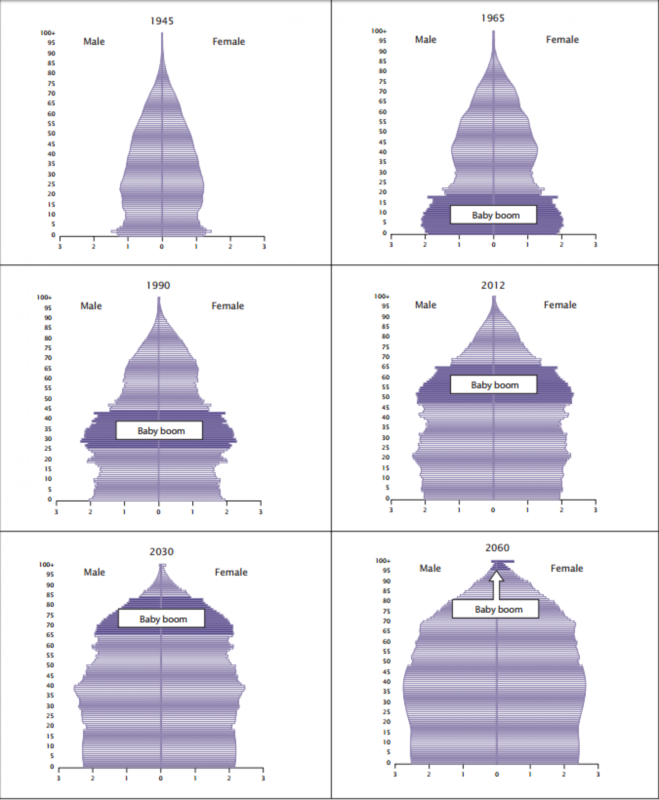 The boomers are by far the largest American generation on record, with 76 million people born between 1946 and 1964. They are substantially more numerous than the 47 million members of the Silent generation that preceded them, as well as the 55 million Gen Xers, the 66 million millennials and the 69 million post-millennials, according to Pew Research Center. As the boomers reached working age in the 1960s and 1970s, they greatly drove up the supply of labor in the United States, and that in turn boosted economic growth and interest rates. The effect was especially strong because boomer women went to work in much larger numbers than their mothers did, due in part to the women’s rights movement and more readily available birth control. 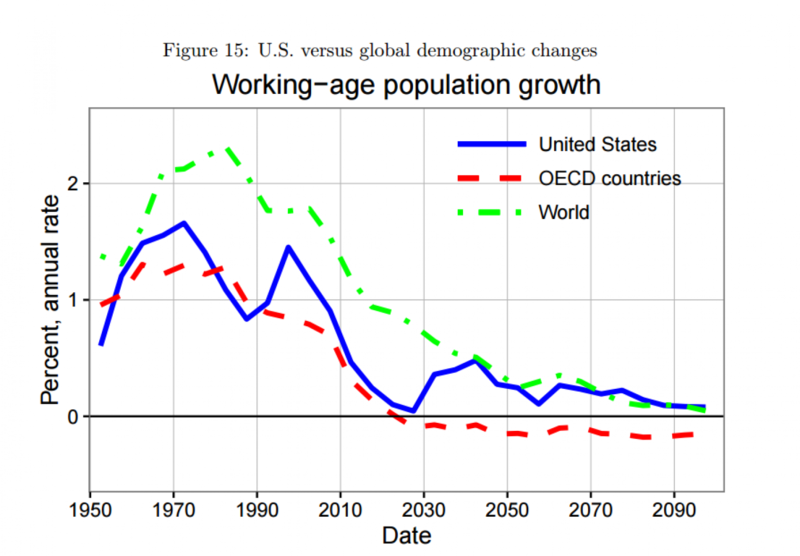 The U.S. economy enjoyed the benefit of a demographic dividend, as the number of workers relative to the total population reached a historic high. But the boomer generation also ended up having fewer children than their parents did. And as they aged and retired, they left fewer people in the American workforce, and that reduced the country’s economic output. The aging and retirement of the boomers also put downward pressure on America’s interest rates, the economists say. Interest rates that stay low for a long time are a problem in that they indicate an economy in which growth is slow and there is little willingness to invest. Low interest rates also leave central bankers with little capacity to stimulate growth in the future by cutting interest rates. The retirement of the baby boomers has meant that what economists call capital — machines, factories, roads and buildings — has become relatively abundant compared to labor. That has depressed the return investors receive for investing in capital, and led to our era of lower investment. And that in turn led to a fall in the interest rate. 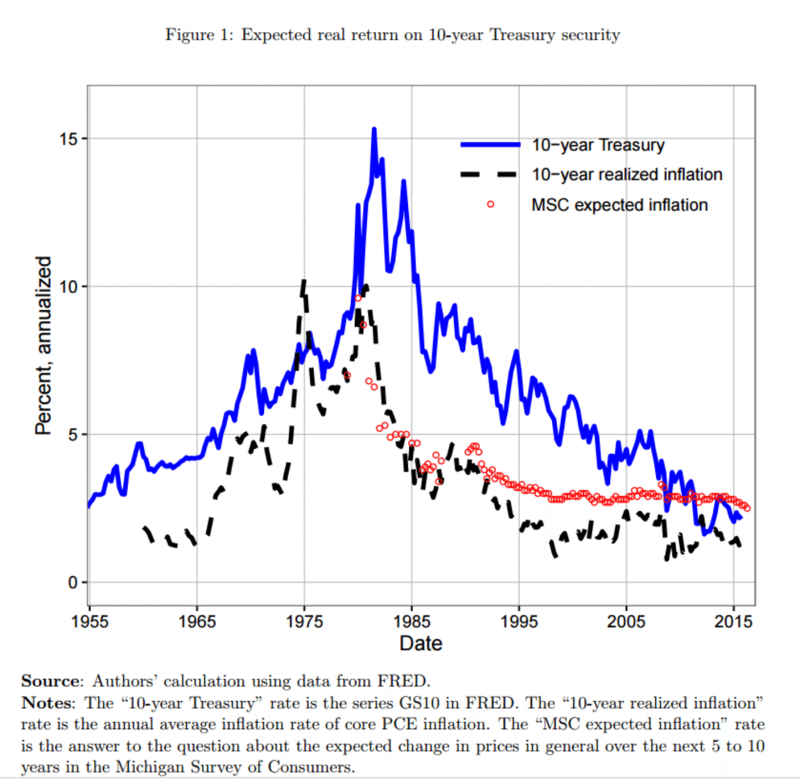 In line with their model, the real interest rate in the United States rose through the 1960s and 1970s, peaked around 1980s, and has gradually declined since then, the economists say. In the last decade, the effect of these trends has become even more pronounced, they say, as more boomers have retired and effects of the IT boom have faded. And their model suggests that low interest rates, low economic growth and low investment are here to stay, since America’s working population is not set to grow much in coming decades. Other countries in Europe and East Asia, are undergoing similar transitions, with rapidly aging populations, too. Because of the timing of this trend, the economists say, many have confused it with the lingering effects of the financial crisis. The financial crisis undoubtedly had a powerful effect on the economy. Actions like the massive bond-buying programs undertaken by central banks around the world to lift their economies are powerful, too. But both may pale in comparison to the economic power of demography.